I was one of the four blogs chosen to devise a way to give away a copy of Swords & Wizardry Complete in PDF. 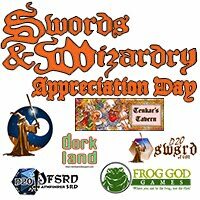 In my Swords & Wizardry Appreciation Day post (Old Schools: Swords & Wizardry) I described how characters could learn special abilities others don’t have, without bolting on an entire feat system or the like. At the end — which may have been the downfall here, it was a long post — I announced that I have a coupon for a PDF copy of Swords & Wizardry Complete. I want to do this as a bit of a challenge rather than a random draw (which would see Tim Short of Gothridge Manor win by default right now, being the only person not me who has commented… and since he put up a prize for I expect he already has a copy), so I asked that people create a school of related abilities something like the examples presented in my post and either provide them in a comment or link to them in the comments. Create a specialized school such as the examples above. At a minimum, each must identify the ten lessons to be learned. Each may also identify an academy (institution where the specialized school can be learned), a traveling master (a person who may teach you the school, if you can persuade him), and/or certain events or conditions around the learning of the lessons. Related art, backing stories, and other extras are welcome as well. Adaptations of existing schools (from the Legends & Lairs books mentioned above) are quite acceptable. Go ahead and improve the samples already shown, I was rushed. Put the school in a comment below, or host it somewhere else and put a link in the comments below. Cut off is midnight Pacific Time between May 7 and May 8, and I’ll announce the winner by May 10. The one I like best when I review them wins. The optional bits are not required, that’s what ‘optional’ means, but I’ll be honest, they can count in the judging. At this point, any submission received stands a good chance of winning, the field is quite small… which I put down largely to announcing the little contest at the end of a long post. There are still two weeks to make an entry, so if you’d like a free PDF of Swords & Wizardry Complete here’s your chance.